If you know the right questions to ask and how to educate your clients about the versatility of their benefits, a whole new world of possibilities opens up to you. Two of the most common situations I encounter are: High Deductible Insurance Plans, and Out-Of-Network Insurance Benefits. More and more, I see clients who tell me it doesn’t matter that I don’t take their insurance because they have high deductible insurance plans. That means they may have to spend anywhere from $2000 – $4000+ out of pocket before their insurance company will pay for anything. Generally, these folks will have to pay out-of-pocket no matter if they see providers in or out of their network. It’s up to them to verify your services will be covered. These folks may have health spending accounts set up by their employers. Some employers find it more cost effective to offer the (less expensive) high deductible plan and then give their employees “x” dollars toward their deductible. The client may have a debit card they can use for health/medical expenses toward meeting their deductible. Others will ask you for a “Super Bill” (a very detailed receipt) to submit to their employer and/or insurance company, toward meeting their deductible. Some health-spending debit cards won’t work unless your credit card machine has been set up as a medical facility (this is done so they can’t just use the card at the local grocery store or bowling alley). Check with your credit card company to find out if you are able to take health spending debit cards or not. Essentially, the client pays your fee and they either pay you with their health-spending card, or they pay you on their own and you provide them with an acceptable receipt. In either case, they get the benefit of your services, and you get the business. You may be able to broaden your client base and help out your clients by working for them as an out-of-network provider. Be aware that not all insurance plans offer out-of-network benefits to those they insure, and those that do offer that provision may have restrictions about what types of providers they will consider acceptable. it is very important you speak directly with the insurance company to get the information you need to educate you and your client about this benefit. When a new client calls me and I don’t take their insurance, I offer to call their insurance company to find out their out-of-network coverage. I get the client’s full name, date of birth, insurance ID number, and the insurance company’s contact number from the back of the benefit card. With this, I have what I need to call the insurance company. Sometimes I’m told outright that there is no out-of-network insurance. Other times, I’m told the client has the same benefit for out-of-network as it is with in-network providers. Most often however, I’m told that the client has an out-of-network deductible and then a co-insurance. For example, you may be told that your potential client’s out-of-network benefit carries a $500 deductible and after that is met, there is a 25% copay for each session. Let’s say your fee is $100/session. A very important question to ask the insurance company is if they will be reimbursing you as the provider, or if the checks will go to the client directly. You continue to collect $100 per session even after the deductible has been met. Starting with session 6 (since the deductible has been met), the client would be reimbursed directly by their insurance company, less their copay. In this example, they would be reimbursed $75 per session. Remind the client that you are doing this as courtesy, and as a way to help them utilize and maximize their insurance benefit. You do not and cannot guarantee coverage or payment from their insurance company; if the insurance company does not reimburse you, they are responsible for payment. Because there are so many variables, it is extremely important you get all of the information upfront directly from the insurance company before you see the client. All of this might sound confusing and time-consuming, but once you have accurate information and you get into the swing of things you’ll see it is not too difficult. You will have to determine if your effort is worth the benefit of increasing your client pool and helping your clients take advantage of benefits for which they are paying. I would love to hear your thoughts on this. Leave a comment below and let me know what you think! Would you like to know a “Shortcut” to ending your battle with confusing and frustrating insurance requirements? 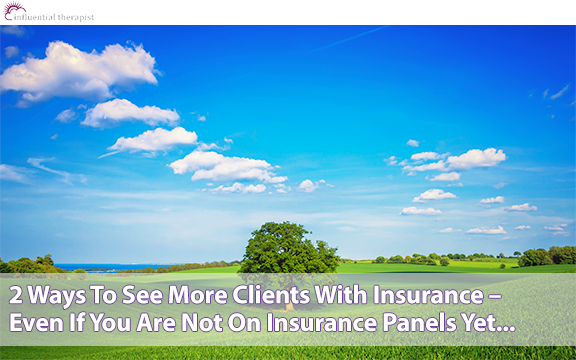 Click here to see how you can book more private pay clients, and end your insurance struggles for good! Great tips! I just can’t imagine since I do all my own billing making these calls to insurance, etc but I can see how this would be a courtesy and go a long way with client rapport. A “single case agreement” where you essentially complete paperwork that argues that you are the best fit for your client. I wonder if other insurance has this option. Thanks for sharing this information. How does this impact Associated Level Clinicians? I am a LAPC in Georgia, starting in private practice and would like to take insurance. @ Felice. You’d have to check with each insurance company to see if they will accept you as an approved out of network provider, and/or if the fees for your services will count toward your client’s high deductible.